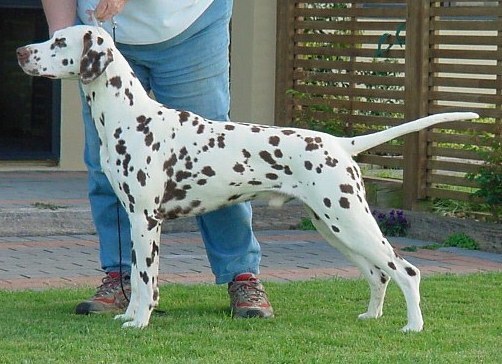 Sired by New Zealand's top all time winning Dalmatian, Dixe has beautiful spotting, a lovely headpiece and ground covering sidegait. Dixie lives with the Dixons and their three children where she is best friend to all (including the bunny!). Dixie was bred to Justin and whelped eight beautiful pups on January 14, 2014 in a litter which has produced a 4-6 month BEST PUPPY IN SHOW and a BEST IN MATCH winner with both majors from the 6-9 puppy class . Four of the eight pups were also Normal Uric Acid (NUA) so we're thrilled! Owners: Debbie & Rodney Dixon & Mary-Lynn Jensen, Ph.D.